Designed by Sir Richard Morrison and built in 1807, the house is a listed building, featuring fine plasterwork and a magnificent cantilevered stairs. Having been lovingly restored over five years the house now boasts beautiful large comfortable bedrooms with well appointed en-suite bathrooms and immaculate bed linen and towels. Guests can relax in the drawing room and sit under the great Holm oaks. Hyde Park House is a scenic and peaceful location with lovely views of Tara Hill and close to several beautiful beaches. Hyde Park House is less than ten minutes to the busy town of Gorey with its cafes ,boutiques and restaurants. Hyde Park House is a great base to tour both Wexford and Wicklow. Breakfast here has a well-earned reputation as one of the finest in the South East and it features produce of the highest quality that is mainly local. 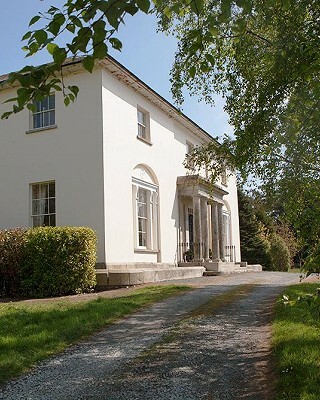 Situated close to Gorey, Hyde Park House is close to a number of visitor attractions including, The Lavender Farm, Wells House, and the cafes, restaurants and boutiques of Gorey and is a very convenient drive from Dublin on the N11.